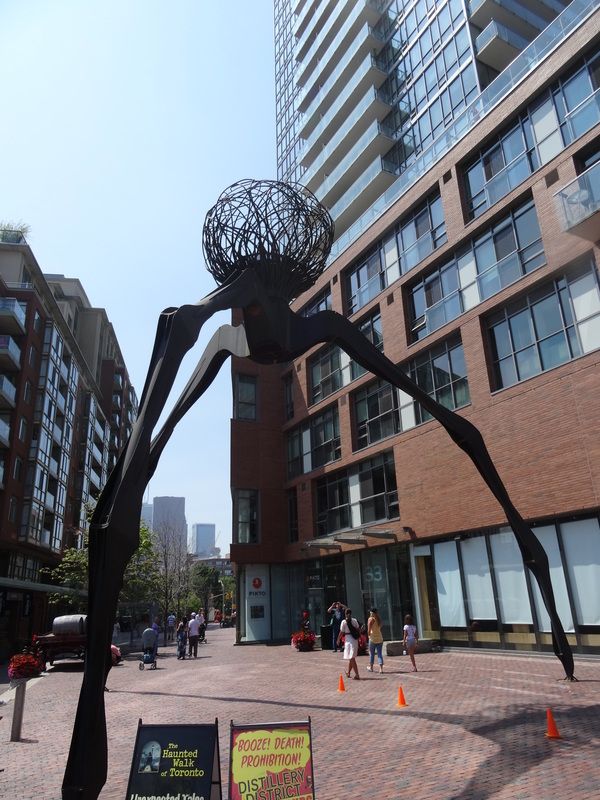 Toronto was the largest of the three eastern Canadian metropolises that we visited. It sits on the northwest shore of Lake Ontario above and across the lake from Buffalo, New York. It was also the most mainstream, or American-like, city and was obviously in the middle of an economic and building boom – only our home of Austin can compete with the number of building cranes that were in downtown Toronto! The fact that Toronto is Canada’s business and financial center made staying in the city center out of sync with our budget. 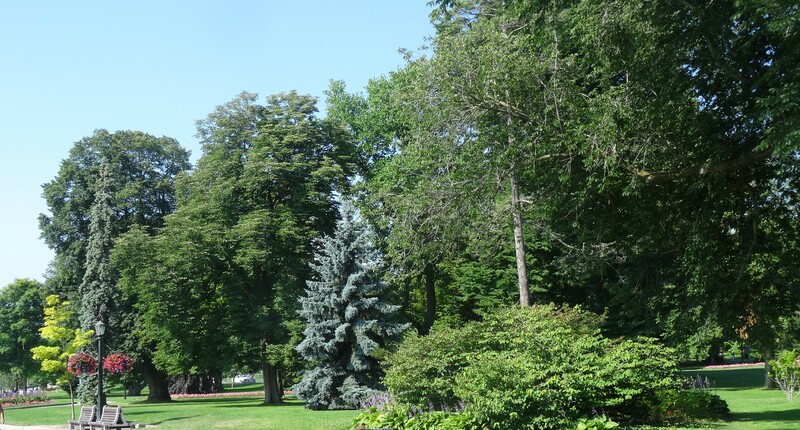 Not a problem though, the Parkview neighborhood in East York was a 15 minute drive from downtown and a short bike ride to Lake Ontario’s beaches and Toronto’s immense park system. Our host was new to Airbnb and had just finished a complete remodel of her basement apartment. We also had access to her backyard hot tub. Trey loves telling the story of soaking in the hot tub and looking up to see a family of raccoons coming through the backyard fence, crossing the yard in front of us on their way to their apparent home under the deck on which we were sitting. We were glad to be Caroline’s first guests. She and her boyfriend were kind enough to invite us to join them for dinner. Our first evening in Toronto was a wonderful time of sharing stories and getting to know our lovely host. It was one of our best Airbnb experiences as many times you never get the opportunity to meet your host. 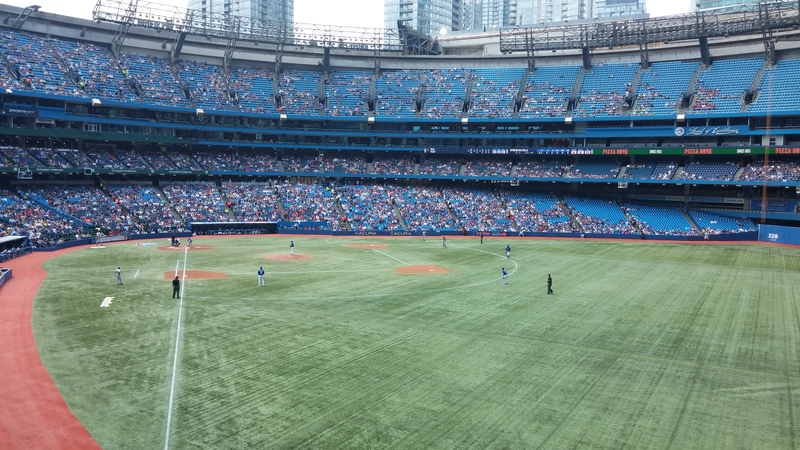 We headed downtown to Rogers Centre, the Toronto Blue Jays baseball team’s stadium, well before the game’s noon start time. This gave us an opportunity to walk around downtown a bit and get a feel for the city. It was also our intent to grab breakfast but found that our options were limited. We passed up the Texas Lone Star Grill – just didn’t seem right – and instead decided to push the clock and wait in line to be seated at Cora’s. Glad we did – Cora’s has been a favorite of Canadians since 1987 and is known for their generous portions of fresh fruit and unique breakfast presentations. For instance, Trey had the Crepomelette – a western cheddar omelet rolled into a crepe. Rogers Centre was the third major league baseball stadium we visited on this tour, and we were lucky with the schedule as the Blue Jays happen to be hosting Trey’s team, the Texas Rangers. The stadium is located at the base of the iconic CN Tower and is quite modern. Its retractable roof was adjusted regularly with the movement of the sun, and I was surprised to see that the stadium has a hotel attached. 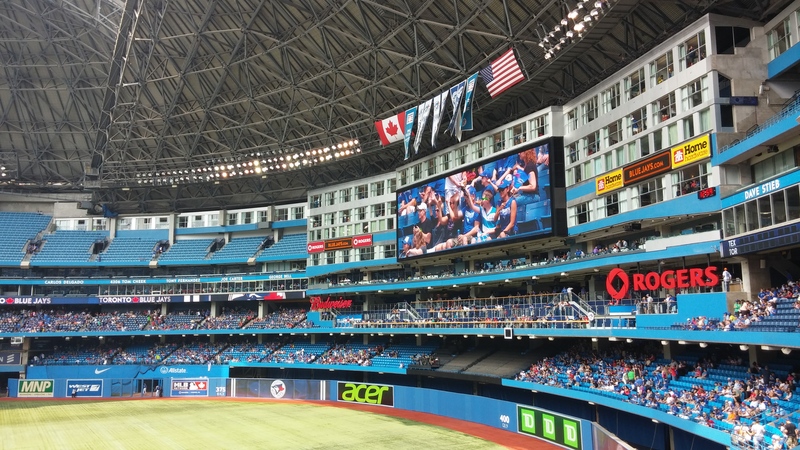 The Renaissance Hotel at Rogers Centre sits in right field with guest rooms facing the field – guests don’t even have to get out bed to watch the game! We were satisfied with our mezzanine seats next to the foul pole and looking down the first base line. Unfortunately though, Trey’s Rangers lost the game 9-6. Great view even from the cheap seats! Our host Caroline is a personal trainer and serious bike rider. She offered to lead us on a morning ride along Lake Ontario and onto the Leslie Street Spit – a three-mile manmade peninsula. We accessed the Martin Goodman waterfront trail from the historic and beautiful Beaches neighborhood east of downtown in “Old City” Toronto. Caroline quickly found that she had to adjust her usual pace in order for me to keep up. It was a lovely ride though and a great way to see Toronto. We rode along Lake Ontario beaches, through Ashbridge Bay Park, and then had to change our plans upon finding the entrance to the spit closed for road repairs. Caroline had warned us that Torontonians like to say that there are only two seasons in Toronto: winter and construction. We continued west along the water admiring the sail boats and yachts docked in the Harbourfront, and then past downtown to Exhibition Place, where the city had just hosted an Indy car race. After going what seemed to be about 15 miles, I became seriously concerned about my ability to make the return trip if we were to venture further. 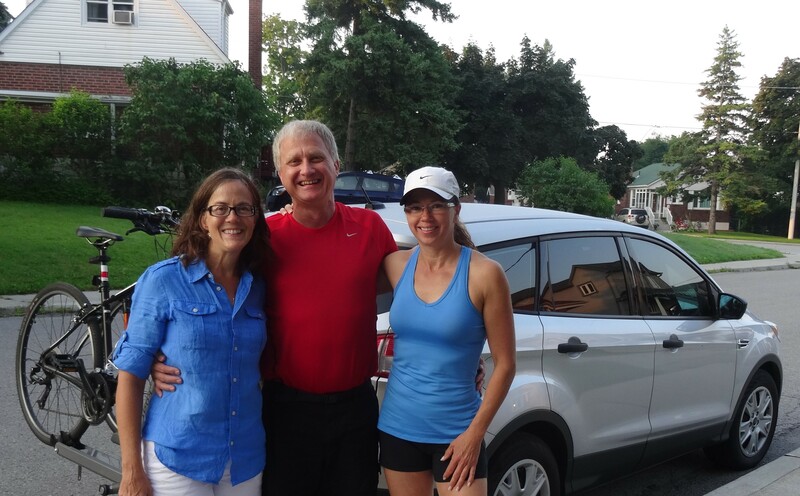 Gratefully, Trey and Caroline accommodated me and we headed back. Taking up two city blocks just east of downtown near Lake Ontario’s shore, “The Distillery” is Toronto’s hub for artisans of all kinds. All businesses are locally owned and there are no name brands sold in the assortment of specialty shops and galleries. The site is a revitalized whiskey and spirits distillery that operated from 1832 to 1990. 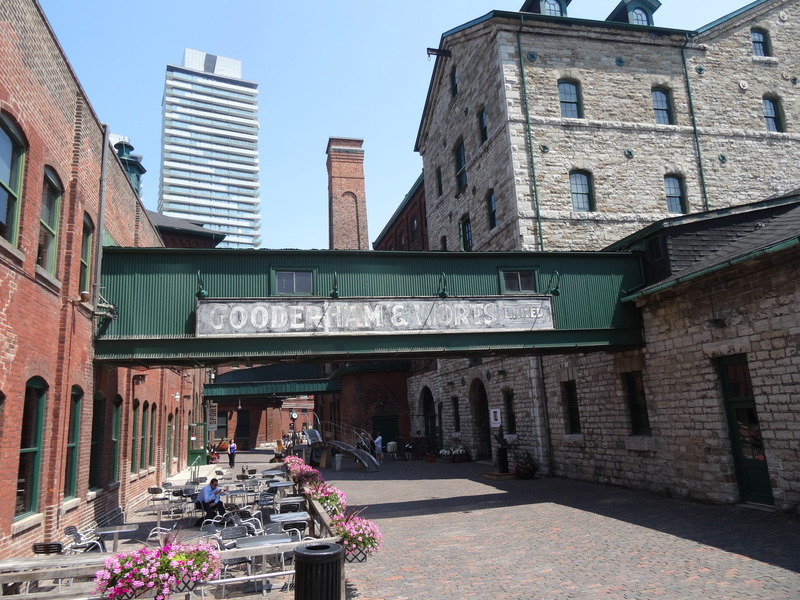 The many buildings that wind through the old Gooderham & Worts Distillery are the largest collection of Victorian industrial architecture in North America. They were built at varying times to keep up with company growth, but maintain a consistent look throughout. 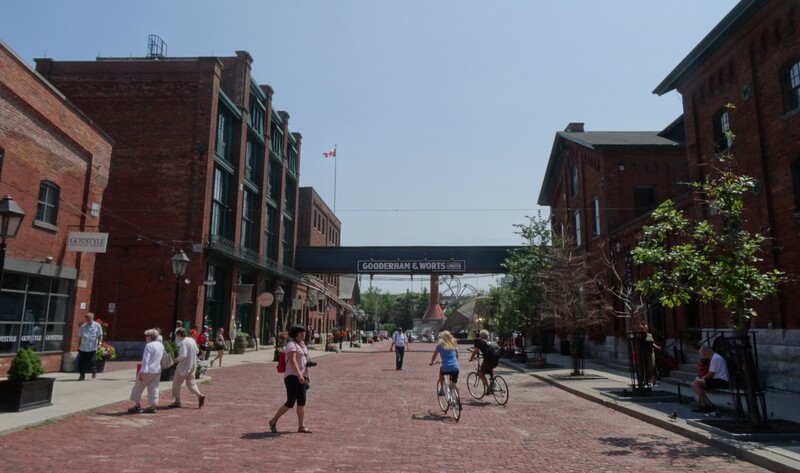 In the period between when the distillery closed in 1990 and when it reopened in 2003 as a residential and shopping area, the site served as a set to many films including Chicago and Cinderella Man. The district was relatively subdued on the Monday we visited, but we understand that the reverse is true on weekends when it is full of live music and other performance artists. The trip to the Toronto Zoo was a spontaneous decision after we eagerly arrived at the famous St. Lawrence Market to find that it is closed on Mondays. 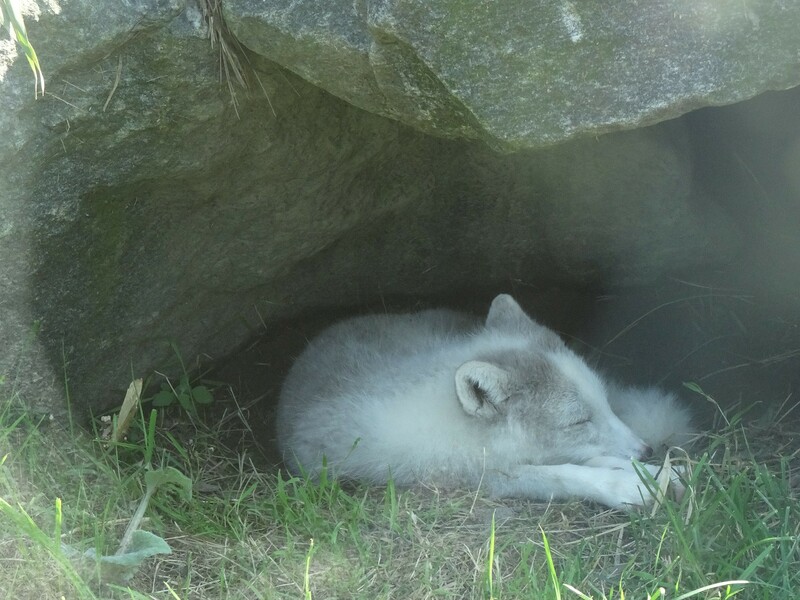 The zoo is located in a suburb about 20 miles northeast of downtown Toronto and ended up being about an hour drive in traffic. I think our impression of the zoo would have been more positive had it not been an unusually hot afternoon for Toronto. 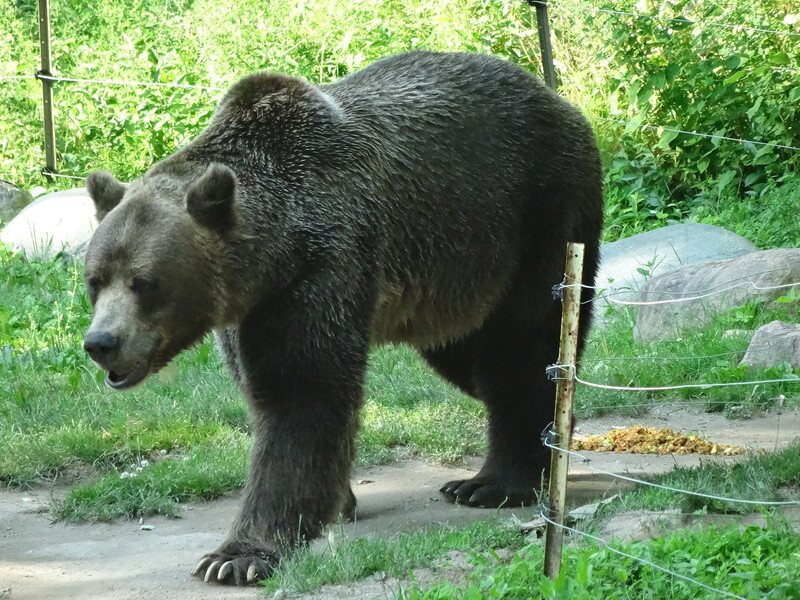 The poor animals were sluggish in the heat and some, including this poor grizzly, appeared to be outright stressed. 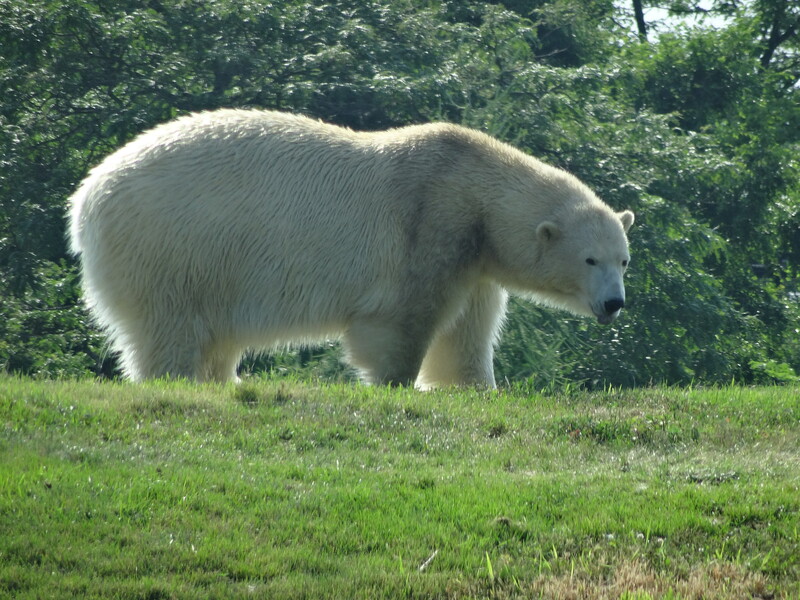 This pacing grizzly bear kept testing the electric fence. It was disturbing. They looked unhappy and we just felt bad for them. Thankfully, the day – our last in Toronto — ended much better. Our host’s daughter had made dinner for us and we enjoyed the delicious meal of Indian Butter Chicken with rice and steamed broccoli on the deck with a bottle of Niagara Valley red blend wine. We were pleased to get to visit with our host again and share more stories. The following morning we were able to meet our host’s friend that had helped with the apartment’s remodeling. Mary greeted us with a small cooler she had packed with drinks for our drive to Pittsburgh, which we very much appreciated – the cherry on top of our already high regard for Canada and Canadians! Caroline seeing us off on our return to the U.S.
We’d been told by multiple sources to see Niagara Falls from the Canadian side. We were glad to hear this since the Canadian border was also the most logistically convenient choice for us. 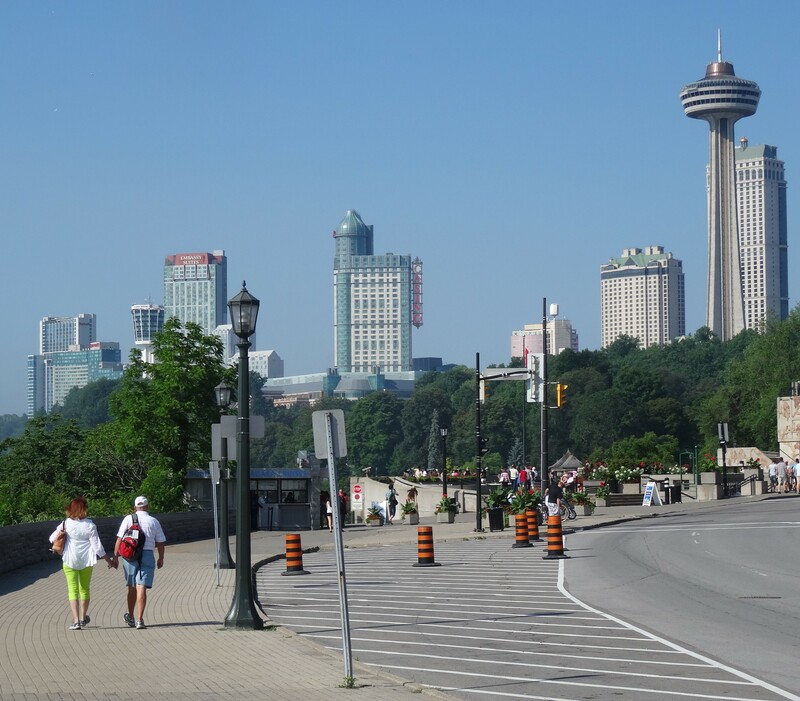 The city of Niagara Falls, Ontario is very clean and quaint, and surprisingly understated despite the fact that it is a top tourist destination. 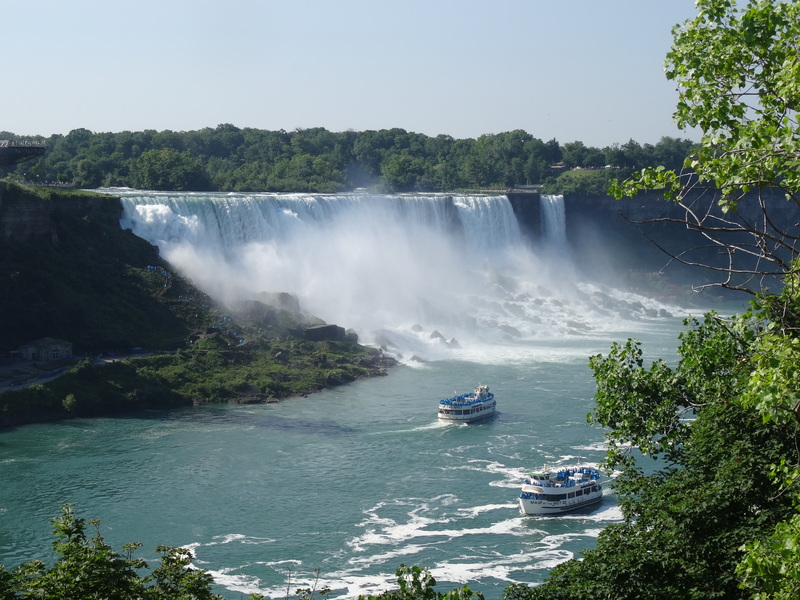 Hotels and businesses, including a casino, tastefully blend in with office buildings that sit along the greenspace that separates them from Niagara Gorge and its spectacular falls. 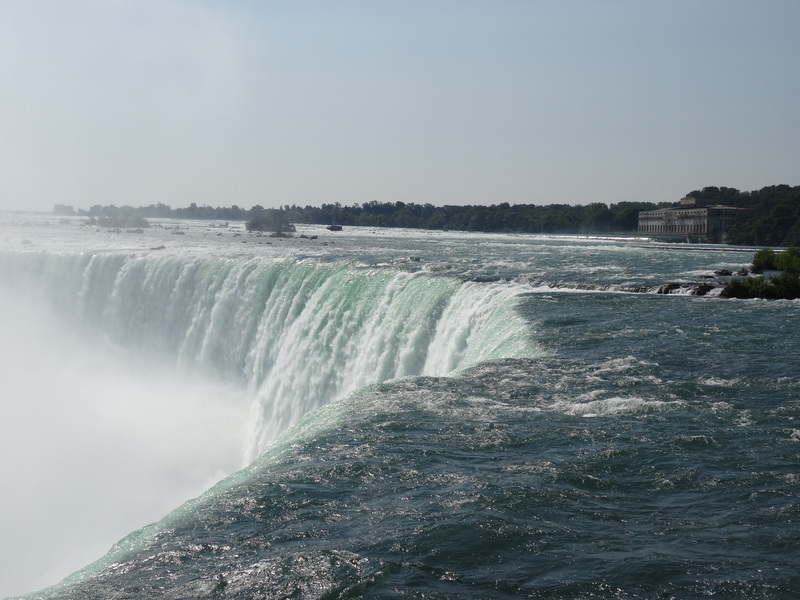 Although I had seen the falls in photographs and films, I was surprised to find that there are actually two separate falls on the Niagara River. Horseshoe Falls is probably the most photographed and sits on the Canada side. The falls on the U.S. border is simply named the American Falls. 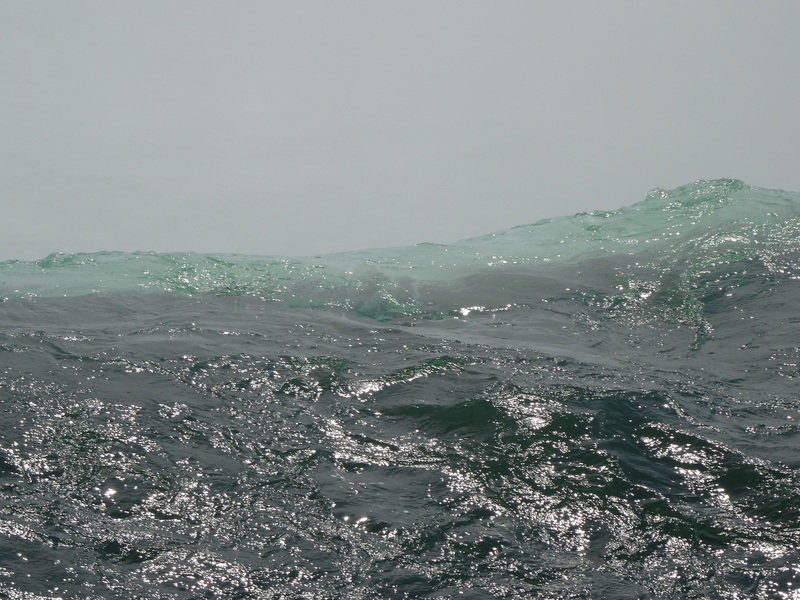 The water of the Niagara River flows at 35 mph moving water from Lake Erie into Lake Ontario. Photos and films do not adequately portray the beauty and power of the water flowing over the 180 foot cliff. Any attempt I make to describe it with words will fall far short of the actual experience. The best I can do is….Wow! I advise anyone who has an opportunity to experience Niagara, to do so! 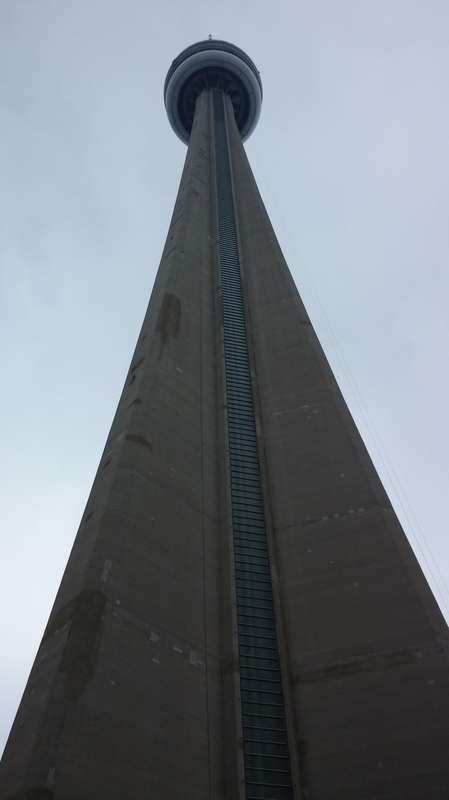 So glad that you enjoyed Toronto, my favourite Canadian city and one that I visited many times when I was working for Ranco/Teccor, some great restaurants there!. Once had a boss who couldn’t take the revolving restaurant in the CN Tower and we had to move to the startionary part. And Niagara Falls, been there several times with friends and family plus back in 1969 I was there when they diverted the American Falls for maintenance work so I have photos of those falls with no water going over them. Sam, you will have to show us your Niagara Falls photos when we get to England!